Luke and I stayed in the perfect Parisian apartment. It was located in the 11th arrondissement and your quintessential Parisian living quarters. The main entry to the building was through a large blue door with a doorknob placed in the center (a typical front door in Paris). Once you made your way past the entry the most beautiful old-wood staircase with blue rails was there to greet you. It was the most perfect Parisian blue that just happens to match the large front door. It was a workout to make your way up the stairs - but also hard to complain, because you're in Paris and about to walk up to the most perfect apartment. The wood was smooth and antiquated; an indication of years and years of use. It made me wonder, how long have these stairs been here and what kind of activities have these stairs seen to make them this weathered? There are so many questions behind each and every detail. I always find myself wondering the history. A question that you can literally ask yourself anywhere in the world - but find yourself asking even more in Paris. 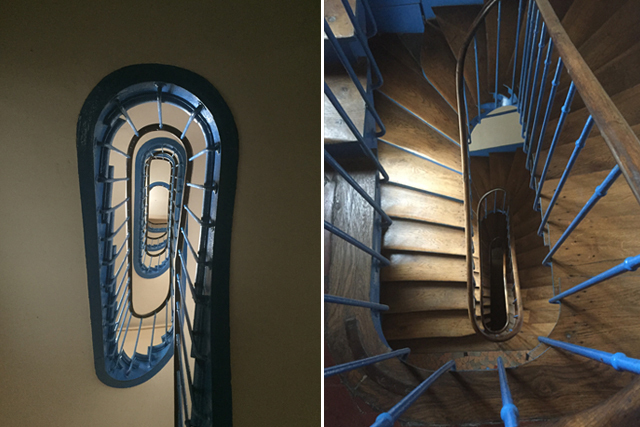 During our stay we trekked down these very stairs to explore the streets of Paris. We trekked up these stairs when we needed to rest in the apartment after long days of walking the city. We also trekked up groceries from the corner market and boulangerie. These stairs witnessed croissants, macarons and bottles of cheap red wine making its way up to the top. Lastly, these stairs witnessed two Americans having the absolute time of their lives and not wanting their Paris adventures to end. I didn't think I would ever miss reaching the top of these stairs, with very few breaths left to take, but I do, very much.